We’d love your help. Let us know what’s wrong with this preview of Stumpkin by Lucy Ruth Cummins. There’s just one pro From the critically acclaimed author and illustrator of A Hungry Lion comes a unique Halloween story about a stemless pumpkin who dreams of becoming a jack-o-lantern. To ask other readers questions about Stumpkin, please sign up. The pumpkin without a stem is left on the shop stand just before Halloween. Obviously its name is Stumpkin. Don't worry though, only happy endings for Stumpkin. 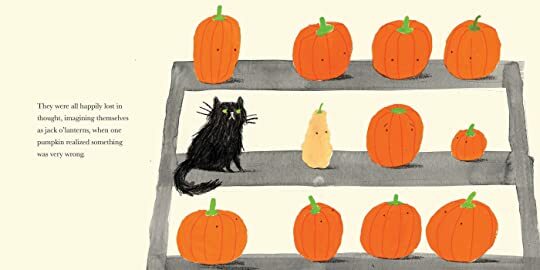 As he watches his friends one by one be chosen to be turned into lucky Jack-O-lanterns, Stumpkin worries that no one will want him because he has no stem. A very sweet story with GORGEOUS illustrations by the author. This was a simply told story of a misfit pumpkin that lacks a stem, kind of an Ugly Duckling or maybe a Tacky the Penguin or Lambert the Sheepish Lion sort of pumpkin story. Nicely done on the whole. Would appeal to younger elementary audiences. Not bad. Wow! Love this cheeky Halloween read about the 'perfect' who longs to be a jack O'lantern but lacks a stalk! This without a stump pumpkin feels awful when it's the last left behind right before Halloween. Very cute and sweet story about a pumpkin without a stem. No tricks, only treats, haha! So cute. Possibly a modern classic. Adorable stemless pumpkin yearns for a window like all his pumpkin friends and despairs he will never be purchased. Love the minimal use of color and black space. Be sure to check out the case cover art! Even the gourd?! A really cute, not scary Halloween story. I love the couple pages of illustrations that give away our ending. It was the perfect way to show what was happening. Highly recommended to add to a library's Halloween collection. A new story for Halloween about pumpkins in a store window. Will anyone choose Stumpkin for their jack o'lantern? A story about the longing to belong and the fear of being chosen last. My favorite moment is when Stumpkin first sees out of his new eyes. Brilliant choice of perspective. Poor Stumpkin!!! I will admit I did tear up reading this because I felt so badly for Stumpkin, but it has a great moral to it. I'm also extremely partial to the art style that was chosen for this! Stumpkin is one of the pumpkins for sale outside a little shop in the big city. He is a nearly perfect pumpkin. He is bright orange, round and large. Unfortunately though, Stumpkin is missing his stem and only has a little stump instead. As Halloween grows closer, one pumpkin after another is selected to be turned into a jack-o-lantern in the neighborhood. They are placed up in apartment windows and look down at the little shop below. Even the gourd is selected before Stumpkin, leaving him all a Stumpkin is one of the pumpkins for sale outside a little shop in the big city. He is a nearly perfect pumpkin. He is bright orange, round and large. Unfortunately though, Stumpkin is missing his stem and only has a little stump instead. As Halloween grows closer, one pumpkin after another is selected to be turned into a jack-o-lantern in the neighborhood. They are placed up in apartment windows and look down at the little shop below. Even the gourd is selected before Stumpkin, leaving him all alone. But there is a happy Halloween ending to come! Cummins’ story written in a simple style. She shows the difference between Stumpkin and the others, explaining why he is left behind. Children listening to the story will protest that they would pick Stumpkin first since he is so lovely. The feeling of being different and left out builds as the story moves ahead and Stumpkin is left alone and sad. 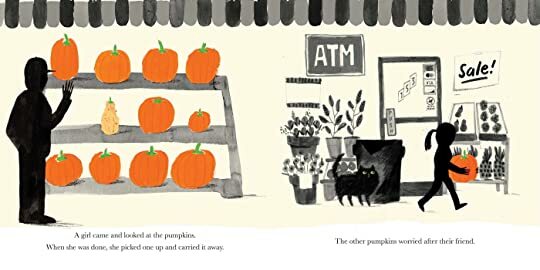 The simple art adds to the appeal of the book with its bright oranges, black cat and jack-o-lantern grins. It is impressive how much emotion she can convey with a few dots and lines on a round pumpkin. Poor little Stumpkin is a pumpkin who is missing his stem. Day after day he is passed over, and day after day he watches other pumpkins leave the market and become a jack o'lantern in a nearby window. When Halloween arrives, he gives up hope of becoming a jack o'lantern himself. But he discovers that there is a special place for everyone including him. Everyone who has fallen short of the standard of commercial beauty will relate to Stumpkin and his plight. 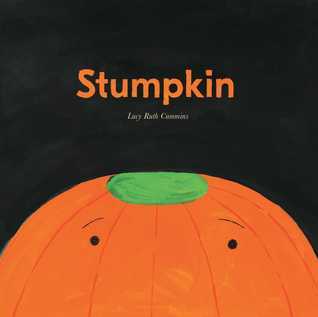 This story is a reminder to children t Poor little Stumpkin is a pumpkin who is missing his stem. Day after day he is passed over, and day after day he watches other pumpkins leave the market and become a jack o'lantern in a nearby window. When Halloween arrives, he gives up hope of becoming a jack o'lantern himself. But he discovers that there is a special place for everyone including him. Everyone who has fallen short of the standard of commercial beauty will relate to Stumpkin and his plight. This story is a reminder to children that everyone is special and that there is someone for everyone. It can also be read as a metaphor for someone with a minor disability who is incredibly self-conscious about not being entirely whole. While the story seems to imply that Stumpkin is overlooked due to his lack of stem, this may only be his perception of the situation. The criteria used for pumpkin selection is never explained except for the baby in the stroller who pointed seemingly at random. Cummins certainly has a strong eye for perspective, colour, tone and use of double and single-page spreads. She is also a master of saying much with very little. As Stumpkin is left alone outside the storefront, Cummins uses silhouettes of people coming along and choosing their pumpkins but it is Stumpkin's reactions and thoughts we look to here until a wonderful, uplfiting switch of perspective near the end. At the local grocery store there is a stand of pumpkins and they are each excited that it is Halloween and time be chosen and made into a jack o’lantern. Each pumpkin gets picked except for one who realizes that instead of a stem he has stump. He never is chosen but the owner himself turns him into a jack o’lantern and he remains at the store happily. There is not much to recommend this book. The story is overly simple as are the illustrations and characters. Nothing gets developed, from the characters to the message. The best part of the book is the thick textured cover that feels deluxe. Stumpkin wants nothing more than to be a jack-o-lantern for Halloween. However, there's something different about him from the other pumpkins - he's stemless. As Stumpkin watches the other pumpkins get chosen, he begins to think he'll never become a jack-o-lantern. However, in the end, Stumpkin learns he was right where he was meant to be all along. The storyline of this picture book is cute but nothing extraordinary. The thing which makes it unique is the illustrations. The setting and characters are all gray scale while the pumpkins are the only splash of color on the page. The illustrations also portray Stumpkins point of view once he gets chosen. Very unique! It's a term of endearment. It's a mode of transportation in a popular fairy tale. It's rich in fiber and low in carbohydrates. It is a popular and main ingredient in food especially during the autumn season. Scientifically, it's known as a fruit but there are those who argue it's a vegetable. As October 31st draws nearer, grocery stores and farmers' markets are featuring it prominently. Children can hardly wait to find the best one. Stumpkin (Atheneum Books for Young Readers, July 24, 2018) writ It's a term of endearment. It's a mode of transportation in a popular fairy tale. It's rich in fiber and low in carbohydrates. It is a popular and main ingredient in food especially during the autumn season. Scientifically, it's known as a fruit but there are those who argue it's a vegetable. As October 31st draws nearer, grocery stores and farmers' markets are featuring it prominently. Children can hardly wait to find the best one. Stumpkin (Atheneum Books for Young Readers, July 24, 2018) written and illustrated by Lucy Ruth Cummins (A Hungry Lion or A Dwindling Assortment of Animals) is about a pumpkin who believes his perfection is flawed. What a cute book for Halloween! We see the pumpkin's journey as it waits anxiously on a shelf, waiting for someone to take it home and make it a Jack-o-lantern. The pumpkin worries that no one will love him because he doesn't have a stump, and readers will enjoy trying to guess what will happen next. For: readers looking for a non-scary Halloween book; fans of Halloween in general. Possible red flags: The pumpkin worries about his body and thinks no one will love him, which may lead to further com What a cute book for Halloween! We see the pumpkin's journey as it waits anxiously on a shelf, waiting for someone to take it home and make it a Jack-o-lantern. The pumpkin worries that no one will love him because he doesn't have a stump, and readers will enjoy trying to guess what will happen next. I love this book! I read it three times today and have shared it with several people already. I had already chosen books for storytime next week but Stumpkin is taking their place. And I cannot wait to share it with the grands. I hope they love it as much as I do. I empathized with Stumpkin - not being the first one chosen. And the sadness he felt at being left out - not being turned into a jack-o-lantern like his friends. Plus the suspense at the end - what will happen to poor Stumpkin? This is a Halloween story that works great for younger children! I loved this book because it does work great for a younger audience. It is not the typical Halloween book. It is not scary or full of monsters and goblins, but a little pumpkin that just wants to be carved into a beautiful jack o lantern like the rest of the pumpkins. Stumpkin is different from the rest of the pumpkins but that’s okay because there is nothing wrong with being different. I really liked this book, because the images were portrayed in a different way. All the other objects and characters in the book were made dark and colored black, except for the main characters which were the pumpkins. I liked that the book was told from the point of view of the pumpkin and that even though Stumpkin was the only pumpkin that was not picked to get placed on a window sill he ended up being special in the end. This book is also fun for children to read and easy to understand. Stumpkin, who sits on display in a store window, looks a little different than the other pumpkins on display. He has one wish-to become a jack-o-lantern. One by one pumpkins leave the store and become smiling jack-o-lanterns. When will it be Stumpkin’s turn? A wonderful fall read with a clever surprise ending. The art is full of the oranges, blacks and greys associated with this time of year. Gouache paint, pencil, ink, and brush marker bring the illustrations to life. And the premise feels forced. Not my favorite Halloween book, to be sure. pumpkins sit together before Halloween wondering who will get picked and why people taking them home. but across the street they eventually see their friends light up the windows of the apartment complex. each day a new friend light up a window. But Stumpkin is different he doesn't have a stem,...will anyone take him?